The picture above is from the Hokumburg Goombah, and was featured on NPR’s Krulwich Wonders blog. (Hokumburg says he just found it on Wikipedia.) Hokumberg asserts that, as an early work of Daguerre himself, it could be the first photograph taken of a human being. The photo is haunting enough on its face (it reminds me a bit of a certain series’ illustrations that still haunt my nightmares), but given its possible significance, and the process involved in its production, it’s especially powerful. 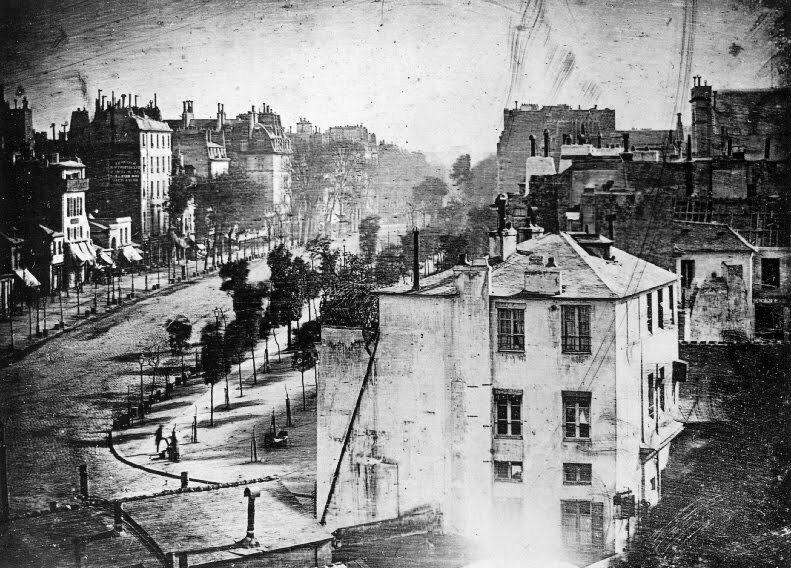 With an exposure time of ten minutes, the camera surely saw a great deal of traffic on Boulevard du Temple, but the photograph captured only the man, in the lower left corner, who stood still.